Free Cell Phone Lot - a temporary way-station for picking up passengers at the Airport, thereby avoiding a series of loops past the terminals and around airport roadways, by waiting in a 50-space parking lot. Once contact is made between the driver and incoming passenger, proceed to the terminals for pick-up. Maximum waiting time is 60 minutes. Vehicles must be turned off and attended at all times; flight information displays keep you posted. The Cell Phone Lot has food/drink vending machines; it is self-monitored, its signage is with clear instructions at the entrance and along North Harbor Drive. Open 24/7 with portable restrooms. 1. SAN Park Harbor Drive, 3015 North Harbor Drive, has 500 spaces. Call either 619.400.2333 or dial 22 from any transportation phone board in the passenger terminals. Green shuttle bus to terminals. 2. SAN Park NTC, 2395 McCain Road, has 1,300 spaces. Call either 619.400.2323 or dial 22 from any transportation phone board in the passenger terminals. Red shuttle bus to terminals. 3. SAN Park Pacific Highway, 3302 Pacific Highway, has 2,200 spaces. Call either 888.2-FLY-SAN or dial 22 from any transportation phone board in the passenger terminals. Blue shuttle bus to terminals. 2. The fully-staffed payment booths at the exit gates of each parking lot. Both accept cash and credit cards (VISA, Master Card, American Express, Discover, and Diner�s Club). Several ATM machines are located within each terminal. Disabled Parking is available at all on-site lots. Well-defined spaces are conveniently located near each Skybridge elevator and all entry points for each terminal. For additional information call Parking Information at 619.291.2087. 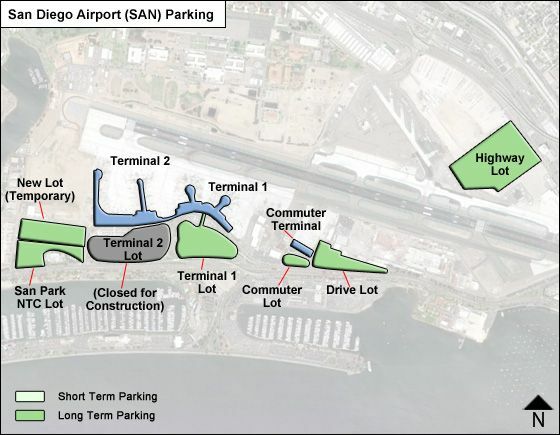 How to get to short term parking from terminal 1? Thanks for the directions to short term parking.